The word [parietal] has its origin in the Greek term [paries] meaning "wall". [Parietal] then means "pertaining to a wall", wall-related", or simply stated, "wall". Following are some examples of the use of this term. 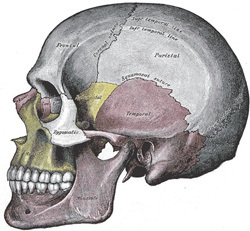 The parietal bones of the cranium (os parietale), create the lateral "wall" of the cranium. These quadrangular bones join in the midline forming the sagittal suture. (see image). Click here for a detailed description of the parietal bone. The term [parietal] is also used to denote membranes that are related to the body wall. The parietal peritoneum is the portion of the peritoneal membrane that is found away from the viscera and in relation to the abdominal wall. The pleura is a membrane that lines the lungs, and it has a component that is related to the wall of the thorax. This is the [parietal] pleura. There is a couple of cases where the use of term [parietal] is not related to a wall, but rather as "away from a viscus". An example of this would be the parietal pericardium, where the parietal component is the membrane that is away from the visceralpericardium. An interesting use of the term is legal, where a [parietal] law, is used to denote a law that establishes boundaries or "walls" between legal parties.